Calling all coffee addicts… there’s a new kid in town! Eat Your Coffee Bars contain a cup of coffee in each bar! They’re vegan, organic, gluten-free, non-GMO, and made with fair trade coffee! When it comes to coffee, I’m slightly (and by “slightly” I mean VERY) picky. It needs to be smooth, not too bitter, and of course, it better wake me up! I recently started a new job that requires me to wake up incredibly early and commute about 40 minutes to get there. So, even making coffee before I leave can throw off my schedule and make me late. That’s why I am so happy to have found these Eat Your Coffee Bars! I don’t need to make my coffee, I just eat a bar! The Mocha Latte Coffee Bar is made with dates, gluten-free oats, almond butter, and dark chocolate. It is chewy, sweet, and full of chocolate-y coffee flavor. The dark chocolate chips really amp up the mocha flavor and cashews give it some crunch, making this a seriously delicious pick me up! The Caramel Macchiato Coffee Bar actually tastes like a fancy drink that would cost you around $7.00 at Starbucks! The sweetness of the dates and the subtle bitterness of the coffee are in perfect balance. Yum! The Coconut Mocha CoffeeBar is my favorite! It is chewy like the others and has a sweet coconut flavor that is absolutely mouthwatering. It also has brown rice and quinoa to make it crunchy and satisfying. The combo of coconut, dark chocolate, and coffee really can’t be beat! Eat Your Coffee Bars are delicious, good for you and will actually wake your a$$ up! Whether you’re a coffee addict (like myself) or just want a healthy, easy way to get energized, these bars are for you! To make things even better, this company is part of The Chain Collaborative, a non-profit that supports coffee producers in Nicaragua and Guatemala. Awesome! Thank you, Eat Your Coffee, for sending me these fantastic bars to review! I highly recommend them! The products reviewed are vegan and cruelty free. Calling all coffee junkies… here’s a way to get your fix and help your skin at the same time! I drink a vanilla latte almost everyday, so I just had to try the Vanilla Latte Coffee Scrub! Organic sugar makes this a great exfoliator to get rid of dead skin cells. The coffee almond oil leaves your skin smooth and moisturized. My favorite thing about this scrub is the smell! As you scrub away in a warm shower, the bathroom fills with a sweet delicious coffee scent. This scrub is truly any coffee addict’s dream! The Coffee Infused Eye Serum comes in a convenient roller ball that easily glides the product onto your skin. 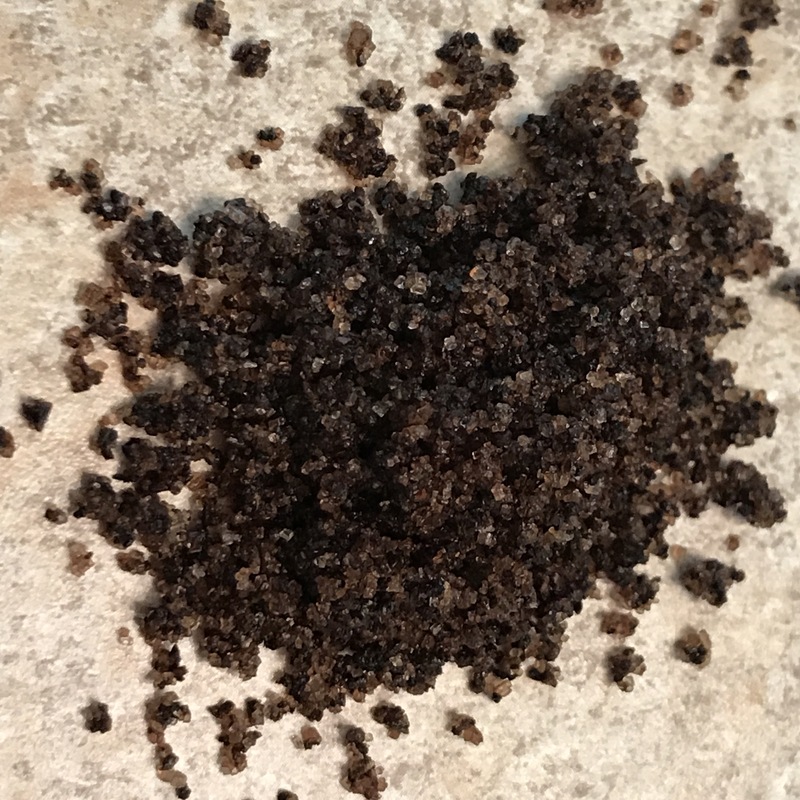 It has a unique coffee/herbal scent and a thin consistency so it absorbs quickly. The coffee infused sweet almond oil, along with rose hip, jojoba, and hazelnut oil nourish the delicate skin around the eyes. After using this product, I noticed that my undereyes were moisturized and “perked up” due to the caffiene. I do not suffer from puffy eyes, so I can’t speak about this product’s tightening abilities, but I do feel like my eyes look more awake when I use this eye serum. Pure Stella Skin Care creates naturally effective products that smell delicious and actually work… all without harming animals! What’s not to love? 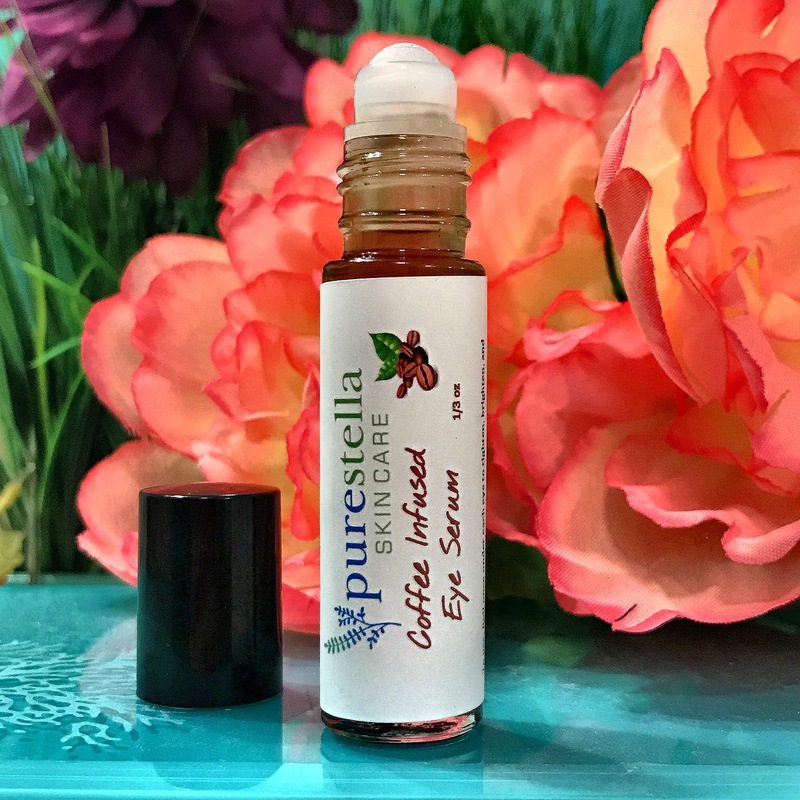 Turn your shower into the best smelling coffee shop around with the Vanilla Latte Coffee Scrub or add a little zip to your skin care routine with the Coffee Infused Eye Serum! Let me know how you like it! Thank you, Pure Stella Skin Care, for providing me with these products to review! Hellooooooo Asheville! I’ve officially relocated from Virginia Beach to Asheville, North Carolina! Instead of ocean views, now I am surround by mountains, and I’m so excited to try out all of the vegan food Asheville has to offer. Right in the heart of downtown Asheville, Green Sage Café offers up tons of vegan friendly breakfast and lunch options. With its active coffee shop scene, people of all ages visit to order a hearty meal, chill out with a nice cup of espresso, or do some work on their laptops. This spot is self -proclaimed as “Asheville’s Healthy Restaurant” and their mission is “to make nourishing food for our community using sustainable practices”. With the use of organic, non-GMO foods, and a separate waste bin for recycling and composting, this place lives up to its name. 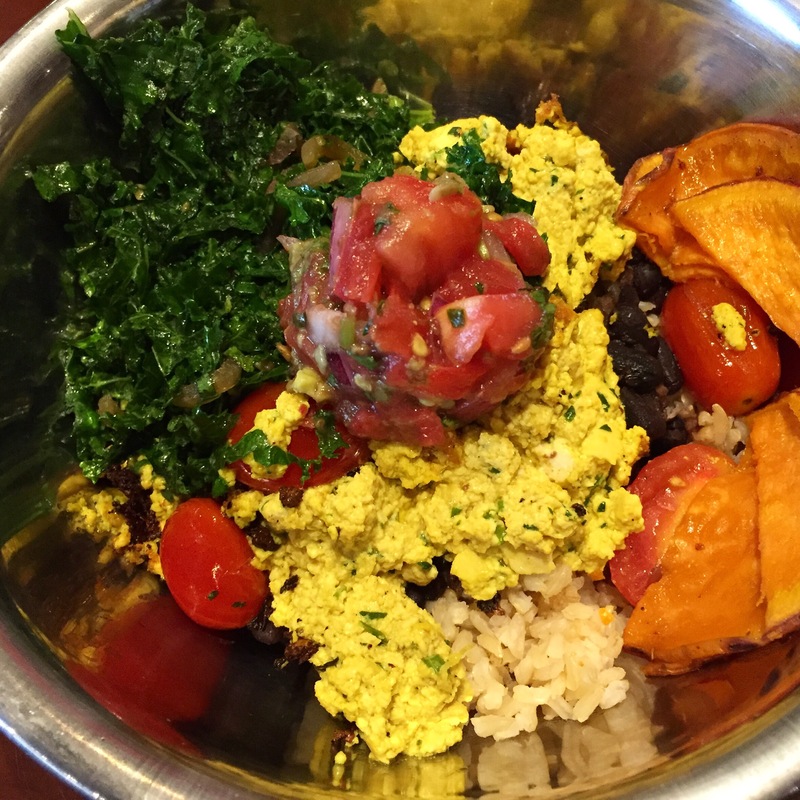 I ordered the Pura Vida Bowl with herbed tofu scramble in place of the eggs $8.50. This bowl was filled with brown rice, black beans, tofu scramble, fresh avocado salsa, grilled sweet potatoes, red onion, and sautéed kale. This bowl had so many flavors and textures that played together beautifully. The fresh veggies added crunch to the beans and rice, and the tofu scramble added a savory herb flavor. The grilled sweet potatoes were sweet and delicious. To drink, I ordered a large Pumpkin Spice latté with almond milk for $4.85. Coconut and soy milk were other non-dairy options. 3 shots of espresso in a huge mug would have been good enough for me (coffee addicts unite!! ), but this was sweet and foamy, with a smooth pumpkin flavor. After moving from Virginia Beach the day before, this was a much needed pick-me-up. Eco-conscious, laid back, fair priced, fresh and healthy vegan options? Umm, YES please! 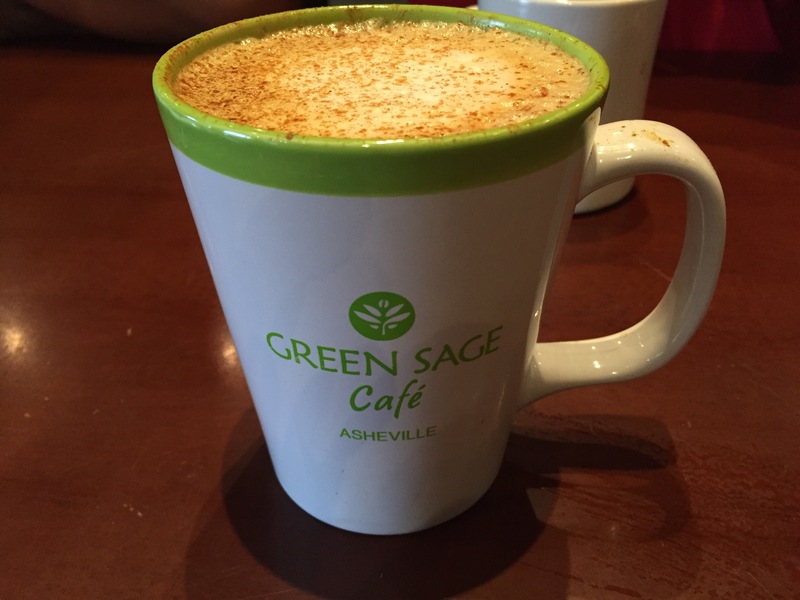 Asheville is lucky enough to have 3 Green Sage Café locations, and I predict that I will be visiting all of them frequently. Let me know if you give this place a try!